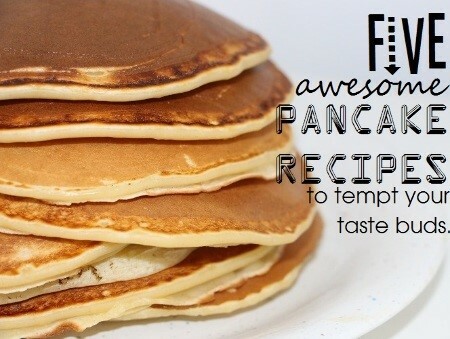 When it comes to breakfast foods, pancakes are way up there on our list of favorites! And it’s a good thing, too, because this week was Pancake Week! To celebrate (and pay tasty homage to this yummy breakfast treat), here are five amazing pancake recipes we’re sure will make your mouth happy! When it comes to decadence, we’re all over these yummy pancakes. And best of all, they’re actually a bit healthier for you than an actual cinnamon roll! It does take a little artistry and patience to get these just right, but we promise they’re worth the effort. And the maple coffee glaze? OMGoodness, yes: and also super easy to make. GET THE RECIPE HERE. Chocolate + Bacon = Sweet, Sweet Bliss. Even the creator of the recipe admits that these pancakes are “a little over the top” … but in all the ways we love. Even if bacon and chocolate together isn’t your thing, we bet you’d enjoy the candied bacon recipe on its own, and the Nutella maple syrup sounds like it’d be a dream come true on some ice cream. So this is really like three or four great recipes in one. You’re welcome. CHECK OUT THE RECIPE HERE. Sure, you could save this recipe for your birthday … but seriously, why wait? This recipe is for that lazy Saturday when you can 100% afford a sugar coma. We tried to validate this recipe with our diet by recognizing there’s only two teaspoons of sugar in the pancakes … and it totally works, if you ignore the fact that you’re also essentially baking and eating a whole cake to make these. But maybe it’s time to go a little Alice in Wonderland and celebrate your unbirthday. We’re sure you’ve earned it. ENJOY THE RECIPE HERE. BONUS: Vegan and Gluten Free Peanut Butter Cup Pancakes! No, these aren’t healthy, but they are healthier than a lot of other pancake recipes. And since we know more and more people are being stricken by gluten allergies, or prefer the vegan lifestyle, we didn’t want to leave anybody out! According to the genius behind this recipe, you absolutely must top these pancakes with an actual peanut butter cup … and we’re not going to argue with a genius. GET THE RECIPE HERE.